These industrial quality, general purpose hand pumps are designed for use in a variety of applications where cylinder plunger must advance rapidly to contact load. 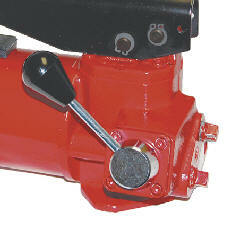 Ideal for use in any situation where heavy-duty manual hydraulic power is desired. 1. Lightweight for maximum portability. 2. Chrome-plated piston rods resist wear and corrosion. 3. Plungers are hard coat anodized. 4. 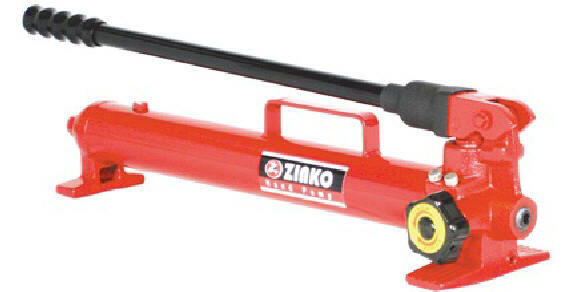 Single-speed pumps can be used in a variety of applications. 5. Internal overload valve prevents pump from being used beyond its rated capacity. 6. External adjustable relief valve with anti-losing mechanism design. 7. Optional 6 ft, 8 ft, 12 ft hose, coupler, and pressure gauge available upon request. 8. Pump, cylinder, and pressure gauge can be assembled as a set to fit any special application. 9. All steel body for durability and long life. Sealed body enables the pump to be used on any direction with head down position - designed for tough jobs. 10. Widely use for applications where composite reservoirs may not be suitable - the steel material won't burn through in welding environments. 11. Large release knob for controlled lowering speed.